Although their own myths and their common name point to Egyptian origins for the gypsies, the Rom, as they call themselves, originated in India, as evidenced by studies of their language. They arrived in Europe in the ninth century and spread across the continent from East to West, reaching England in the 15th century and Scandinavia by the end of the 16th century. A nomadic people, these wanderers were reviled by local populaces wherever they went and regarded as misfits, intruders, foreigners, and thieves. 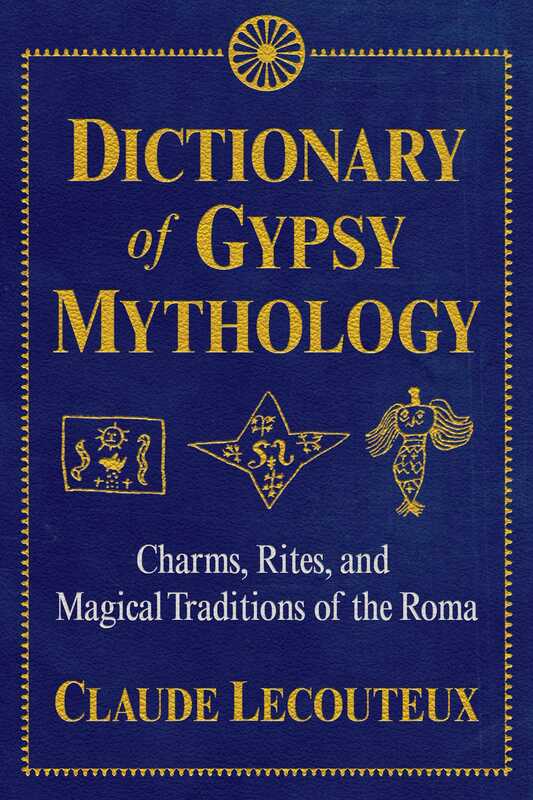 Drawing on a number of sources never before available outside of Eastern Europe, Claude Lecouteux reconstructs the gypsy oral tradition to provide a comprehensive A-to-Z look at gypsy mythology, including their folktales, rites, songs, nursery rhymes, jokes, and magical traditions. His main source is material collected by Heinrich Adalbert von Wlislocki (1856-1907), an ethnologist who lived with gypsies in Romania, Transylvania, and Hungary in the latter half of the 19th century. He presents the origin myths of the gypsies, legends which form the ancestral memory of the gypsy tribes and often closely touch on their daily life. Lecouteux explores the full range of supernatural beings that inhabit the gypsy world, including fairies, undines, ogres, giants, dog-people, and demons, and he examines the three major settings of gypsy folktales--the forest, the waters, and the mountain, which they worshiped as a sacred being in its own right. He also reveals how coexisting with peoples of different religions led the gypsies to adapt or borrow stories and figures from these groups, and he shows how the religious concepts and sacred stories of the Rom testify to a profound syncretism of pagan traditions and Christianity. Complete with rare illustrations and information from obscure sources appearing for the first time in English, this detailed reference work represents an excellent resource for scholars and those seeking to reconnect to their forgotten gypsy heritage. The Rom, better known in many countries as “Gypsies,” were a nomadic people suffering from the inveterate hostility of local populaces who regarded them as misfits, intruders, and foreigners. Sedentary peoples have always viewed wanderers with suspicion, and Gypsies have been attributed with every failing over the centuries and subject to much persecution. The religious concepts of the Rom testify to a profound syncretism of pagan and Christian elements. Having coexisted with numerous peoples of different religions over the course of their tribulations, the Gypsies have certainly borrowed elements from them, but they nevertheless maintained an old pagan pool of beliefs that reveals its existence in the worship of nature, stars, and the elements. As the Gypsies are a people of an oral culture, credit is due to the collectors of folk traditions and ethnologists for having assembled the materials from which it is possible to form some idea of the mythology of the Gypsies. ENGAGEMENT: A week before the wedding day, the fiancées go to the nearest lake or river at night where they stick candles in the bank or hang them from a bush. Among the nomadic Gypsies of Transylvania, this is seen as an offering intended to ensure the fruitfulness of the marriage. If the wind blows the candles out, it is viewed as a bad omen, and the betrothed couple hasten to toss apples and eggs into the water to placate the water spirits. It is believed that the fiancé or fiancée whose candle is extinguished first will be the first to die. If a Bohemian wishes to get married, he hangs a red scarf on the tent of the person he has chosen. If she takes the scarf, it is a sign that she has accepted his marriage proposal. Wlislocki, Heinrich von, Märchen und Sagen, n° 24; Wlislocki, Heinrich von, Volksdichtungen..., n° 64. Wlislocki, Heinrich von, Vom wandernden zigeunervolk, 129. GYPSY DIASPORA: There are several different etiologies concerning the dispersal of the Gypsies across the world and their lack of any fixed abode. According to one legend, when the trades were being awarded to the different people, the Gypsy hid behind God who granted him a portion of what the people gathered there had received. This is why the Gypsies have no country, are scattered across the world, and have to beg them for their portion. When God divvied up lands and goods, he overlooked the Gypsies and gave them barren lands, authorizing them to steal and cheat. And when he gave everyone their share of destinies, the Devil was their lot. Nounev, Y., “Legends,” 49; Kabakova G., Contes et Légendes tsiganes 67, 76; Kenrick, D., Golemanov, D., Three Gypsy tales from the Balkans, 60; Obert, n° 30. ILLITERACY: The Gypsies regard their lack of a written culture as a curse and have a number of legends that explain why. One shows how Dundra, the messenger of God, revealed to them their secret laws and had them written down in a book. The Gypsies left India for Chaldea, but when this country could no longer feed them, the mages ordered them to separate. The most courageous of them returned to India with the sacred books and, today, no one knows what ever 4 became of them. According to another tradition, God came down to earth to give the Gypsies an alphabet, but the only person he could find was an old man accompanied by a donkey because everyone else had gone off to harvest the fruit of the blackthorn. He gave this old man the alphabet written out on a cabbage leaf, but the donkey ate it and thus the Gypsies do no not have an alphabet. Zanko, the chieftain of the Chalderash tribe lamented in 1955: “We have no right to a writing. This is our curse.” According to another tradition, it was their punishment for forging the nails that were used on Christ’s cross. On the other hand, God awarded them the talent to know how to organize festivities and celebrations. Berger, Hermann, “Mythologie der Zigeuner,” 810, de Ville F., Tziganes, témoins des temps, 69–71; Kabakova G., Contes et Légendes tsiganes, 68; Zanko, chef tribal chez les Chalderash, 13, 31; Kogalnitchan Michel de, Esquisse sur l’histoire, les moeurs et la langue des Cigains connus en France sous le nom de Bohémiens, Berlin: Librairie Behr, 1837, 36.